15:20 IST: SIX! That’s massive. MS Dhoni is now taking the charge of the game. He lofts it over the long on for maximum. 14:47 IST: SIX! That’s huge. Vijay Shankar smashes it over the deep mid-wicket for maximum. 14:16 IST: Rohit Sharma and Shikhar Dhawan are out in the middle to start India’s chase. Tim Southee to open the attack for New Zealand. 13:46 IST: 2 runs. In the air… but lands safely. Ross Taylor picks up a double. 13:24 IST: WICKET! Khaleel Ahmed castles Tim Seifert for 84. It’s a big wicket for young Khaleel. 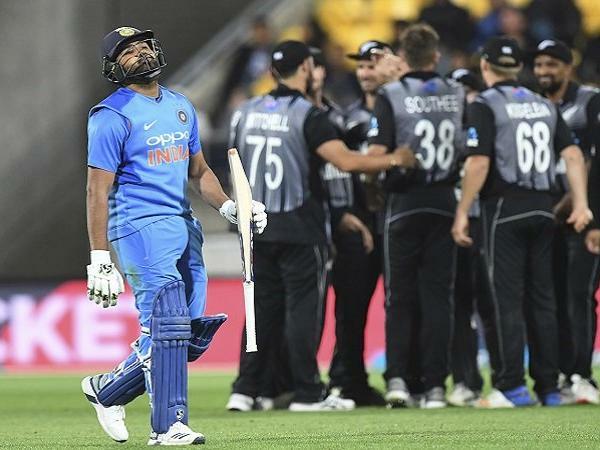 He bowled a perfect yorker to dismantle the stumps and disrupt New Zealand’s momentum. 13:18 IST: Tim Seifert dropped by Dinesh Karthik. He was on 71. It wasn’t an easy catch under lights though. 12:45 IST: SIX! Beautiful shot. Another slower ball picked up nicely. This time it’s Colin Munro. 12:20 IST: “We were looking to have a bowl, based on the wicket on the other night. It’s important to assess the conditions. Daryl Mitchell makes his debut today. Some regular faces, but the two missing out are Bracewell and Neesham. A new squad brings some freshness,” Kane Williamson says at the toss. 12:14 IST: “We have had a good record chasing. Gives us another opportunity to see how well we can bat second. Looks like a good pitch, as we saw in the game earlier so we are looking to set a target,” Rohit Sharma says after winning the toss. 11:50 IST: India’s women cricket team lost their T20I series opener to New Zealand women by 23 runs in Wellington.